In OMLx4 there is no driver for my Epson Expression XP-352 printer. How to install the driver? No, è una roba inutile secondo me. Intanto, evitandolo oggi hai imparato ad installare un pacchetto che hai scaricato. Inoltre la cosole fornisce un output intelleggibile. We have some lsb-* packages but not “lsb” only. To be honest I have no knowledge on the matter, sorry cannot help. From what I see this crap needed lsb-lib64. While last version for cooker was build with qt4 libs and later qt4 libraries were dropped (removed from the repository). This should force instalation without checking dependencies. I can’t verify if it will work because I do not have such a printer. If this not help. Open System Settings --> printers. Then try add your printer manually here. Also I think this epson driver is open source? Is available on Fedora… so I think it is possible to import it to repository. Of cource if needed. 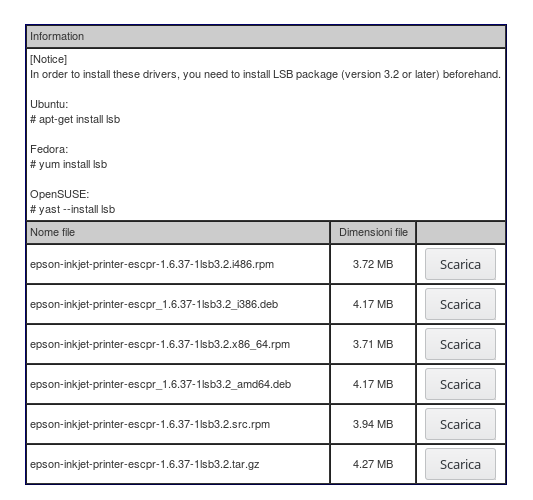 I installed this printer in other distribution (openSuse and Mint 19) then the right Linux driver exists. In OMLx 4 printers list I don’t find it then I tried to download driver from Epson site. I will wait to see if an update of CUPS or similar include the driver. How developers will know to include a missing printer driver in our packages? Let me know if this work correctly. As you have probably seen driver works. Thanks.